In this three-part series, I explore several popular ideas proposed to address the challenge of producing animal foods sustainably: local consumption, organic production, and fish farming. An in-depth look at these proposals seeks to answer the question: can animal foods be produced sustainably? At 200 pounds each per year, Americans eat more meat per capita than any other people in the world. Unfortunately for the rest of the world, they’re catching up with us – and when they do, we’ll need two-thirds more land than exists on the planet to meet the higher demand. The world’s huge production of meat, eggs, fish and dairy is causing a head-on collision between demand for these items and the reality of scarce resources like land, water, and fossil fuels. This isn’t a future threat; it’s happening in real time, right now. It takes up to one hundred times more water, eleven times more fossil fuels, and five times more land to produce animal protein than equal amounts of plant protein. 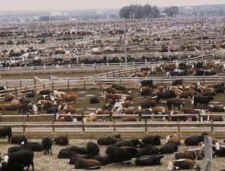 (1) Further, animal food production is now the planet’s single biggest cause of climate change. (2) The machinery of industrial farming is bursting at the seams, spilling animal emissions and production by-products across all environmental media—air, water, and land. In this three-part series, I explore several popular ideas proposed to address the challenge of producing animal foods sustainably: local consumption, organic production, and fish farming. An in-depth look at these proposals seeks to answer the question: can animal foods be produced sustainably? Sustainability, some insist, requires that we consume food raised locally. Food’s carbon footprint is measured using a technique called “life cycle assessment” (LCA), which examines the carbon impact of every step or component in a food item’s production and consumption. LCA measures water use, harvesting methods, packaging materials, storage and preparation techniques, and other factors. But spoiling the local food movement’s heavy emphasis on what it calls “food miles” is the fact that transportation averages only 11 percent of total carbon footprint and is thus a mere fraction of most edible items’ LCA. (3) By contrast, the act of cooking food typically accounts for 25 percent of its carbon footprint, while production accounts for another 17 percent of the carbon footprint. (4) In other words, a modest efficiency or inefficiency in either production or cooking can easily outweigh transportation’s entire effect. Local consumption, then, is not the cure-all to solve the sustainability problems of meat and dairy production. If you eat animal foods, to some extent you might help support small farmers by buying locally. But as we’ve seen, the carbon calculations are complicated, and local buying is often not the most eco-friendly way to consume. (The only truly eco-friendly foods, of course, are plants.) In the next installment, we’ll look at organic production as a potential means to address the problem. Stay tuned! 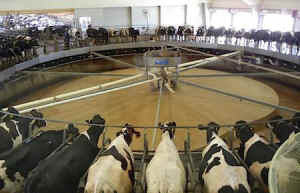 For more surprising information on this and other issues related to animal food production, check out my just-released book Meatonomics: How the Rigged Economics of Meat and Dairy Make You Consume Too Much – and How to Eat Better, Live Longer, and Spend Smarter (Conari Press, 2013). David Robinson Simon, Meatonomics: How the Rigged Economics of Meat and Dairy Make You Consume Too Much—and How to Eat Better, Live Longer, and Spend Smarter (San Francisco: Conari Press, 2013). Robert Goodland and Jeff Anhang, “Livestock and Climate Change: What if the Key Actors in Climate Change Are . . . 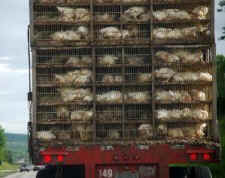 Cows, Pigs and Chickens?” World Watch (November/December 2009): 10–19. Christopher L. Weber and H. Scott Matthews, “Food-Miles and the Relative Climate Impacts of Food Choices in the United States,” Environmental Science and Technology 42, no. 10 (2008): 3508–13. Rich Pirog et al., “Food, Fuel, and Freeways: An Iowa Perspective on How Far Food Travels, Fuel Usage, and Greenhouse Gas Emissions,” Leopold Center for Sustainable Agriculture (2001). Caroline Saunders and Andrew Barber, “Carbon Footprints, Life Cycle Analysis, Food Miles: Global Trade Trends and Market Issues,” Political Science 60, no. 1 (2008): 73–88. James McWilliams, Just Food: Where Locavores Get It Wrong and How We Can Eat Responsibly (New York: Back Bay Books, 2009), 214.